I have been practicing backtracking and I wanted to know how I can improve my code. For eg, I don't want to use global. Also, I am not sure if my code will work for all the cases. Whenever you're writing an algorithm, it should return the answer. Not print and return, not just print. Just return. If you want to print, you can always write print some_algo(...). Note that I'm changing your return type from list to list of lists. Now this will return a list of all the possible transformation lists. There are four other answers here, and they all have very sensible advice. But none of them, as far as I can see, points out the terrible runtime complexity of the chosen algorithm, so I think an additional answer is necessary. In what follows, I'm going to assume that the bug is fixed. 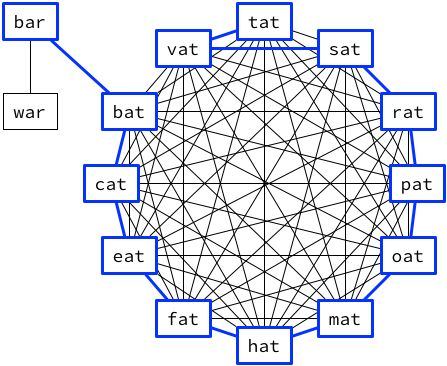 Finding the shortest transformation between two words corresponds to finding the shortest path between the two nodes in the graph. 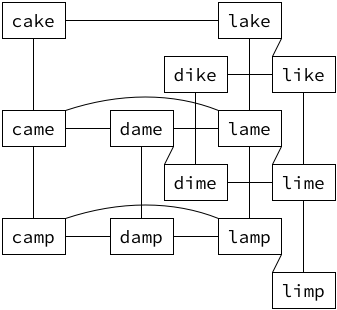 There are standard terms for describing the problem: here nodes, edges, paths. There are concrete representations of the data structure that support efficient operations. You can look up the best known algorithms for solving the problem, instead of having to invent your own. 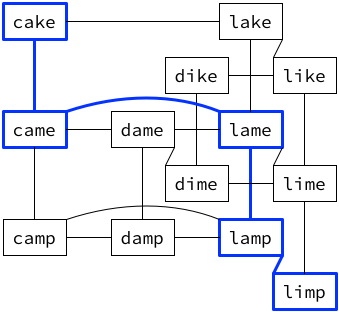 With the bug noted in §1 fixed, what your program does is to generate all the simple paths (paths with no repeated nodes) in the graph of words beginning at start, until it finds a path that leads to end. and so on. You'll see that it will explore every path that starts bar—bat and then visits all the —at words. There are \$ 11! = 39,916,800 \$ such paths, and only when it has explored them all will it consider the path bar—war. Checking to see if two words with \$ m \$ letters differ by one letter takes time \$ O(m) \$, so if there are \$ n \$ words of \$ m \$ letters each, the total runtime is \$ O(n!m) \$. It is possible to do much better than this if you use one of the standard graph search algorithms such as Dijkstra's or A*. Here's an implementation using the latter. collection of words. Raise NotFound if there is no ladder. # Find the neighbourhood of each word. # Admissible estimate of the steps to get from word to end. # Closed set: of words visited in the search. # the node with the smallest f-score. 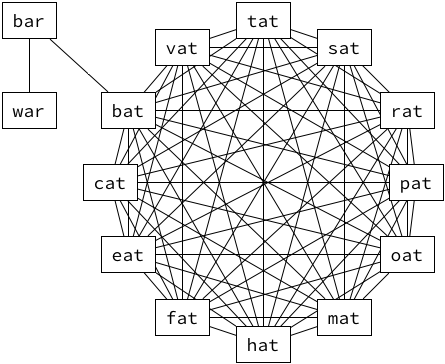 Suppose that there are \$ n \$ words of \$ m \$ letters, and \$ e \$ edges in the graph of words. Then this algorithm takes \$ O(m^2n) \$ to find the edges and then \$ O(e + mn + n \log n) \$ to find the shortest path. You have chosen to require both strings to be the same length. That's fine, but perhaps you would like to also consider adding or removing one letter to be a difference of one. The drawback is that it won't short-circuit as soon as it finds a second difference. For short words like your test case, I don't think that matters. potential_ans[:-1] has no effect. It produces and discards a copy of potential_ans with the last element omitted. You probably wanted potential_ans.pop(). Use your own list as a stack, in which case I would recommend looping instead of recursing. Option 2 is rather tricky to implement, so I recommend that you should stick to your recursive approach. When doing recursion, you should not think of functions as procedures with side-effects. Rather, treat them as functions in a mathematical sense: the function must produce one deterministic answer based solely on its parameters, and result in no side-effects. You could possibly improve efficiency by using append() and pop(), but you should be sure to fully understand how to do recursion properly before you mess with such mutation operations, because they have side-effects. I've removed the count parameter, since it was just a cumbersome way to initialize the chain. I'm going to focus on implementing the recursion. I've mainly just made transform a function sets up the right arrays, and then converted the original implementation into the nested function recursion. Notice I've created a results array for storing the results. Also notice the need to make a copy of the potential answer when storing it as a result, since we will continue to modify potential_ans. I've also modified the list of words so there is more than one result. I assume you want to obtain all answers; it shouldn't be hard to modify this to end the recursion as soon as an answer is discovered... however, a better approach will be described below. Note the use of yield and yield from for yielding results. Using generators has a number of advantages including: you get to see results as they're created, you can stop iterating when you're happy with a result, rather than having to wait for the entire recursion to finish, you don't waste memory/time creating a list of all the results. Generators take a little bit of time to get used to, but they're well worth it, and should often be preferred to returning lists of results. Finally, one last neat trick; the general pattern of "make a change ... do stuff... undo the change" can be error prone; it can be easy to forget to undo the change, or an odd code path (e.g. an exception) skips the change. The other answers suggest making copies; however, backtracking algorithms like this can often suffer massive performance penalties from such a change, so it's worth knowing a pattern that mitigates this problem without introducing copies. Proviso I have not checked the logic of your code, mostly just the styling and language features you could have used but missed. This is a general rule of programming, but one I have found especially good to enforce in Python, particularly because lots of small, single-use functions just look so beautiful when you code them up in PEP-style (which I am far from good at myself). So I'm not sure why you're printing in transform. Generally, you should try to keep logging as its own function, separate from calculations and the like. This is especially true in your function where you print the result and then return it. Why not return and then print wherever you return from, to make your code easier to maintain and understand? Python is passing something like a reference, so the changes you make to potential_ans will persist, at least when you do things like appending letters. Read more on this from this SO post. Seems like you go through your english_words more than you need to. Why don't you break out of your for loop once you find the match you need? Also on efficiency, I'd recommend doing the start==end check after the count check. This might be more efficient (easy to test) and it's certainly clearer and more succinct than the count check you are using now. What does count do in transform? I see you increment it sometimes in transform and you also use it in is_diff_one. As a reader of your code, I wish you'd comment on whether there counts are related...is this some funky global variable manipulation or just your favorite count variable name? This is exactly where comments can save your reader a lot of work. Actually, why do you set up potential_ans as a global variable when you redefine it inside your function anyway? Why don't you just initialize it yourself and keep passing it as a parameter (see above). This is a design decision, so you should comment here to explain to your otherwise puzzled reader. What is the point of your last expression in your for loop over english_words, this one: potential_ans[:-1]. This one has really got me puzzled. Are you changing something? So far as I know Python syntax, you're simply referring to the last element of this list but not doing anything to/with it. Am I missing something? If so, a comment would help here. If not, this should be deleted as it doesn't affect the program at all apart from running an unnecessary expression. Not the answer you're looking for? Browse other questions tagged python algorithm edit-distance backtracking or ask your own question.